(Newser) – A new study on cancer won't make for pleasant reading for tall people. 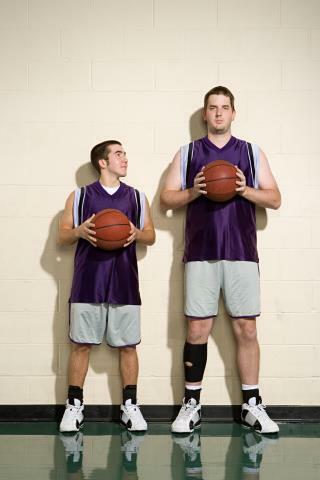 Consider this quote from lead researcher Leonard Nunney of the University of California Riverside: "If you were comparing a 5-foot guy to a basketball player who's over 7 feet tall, then that basketball player has around twice the risk of cancer across the board," he tells Australia's ABC. Yes, Nunney's study in the Proceedings of the Royal Society B suggests that taller people are at greater risk for cancer. The surprisingly simple reason? They have more cells, and thus more things go can wrong in those cells, explains the Guardian. Specifically, the study found that cancer risk rises by 10% for every 4 inches people are above average height—5 feet 4 for women and 5 feet 9 for men, reports CNN. The findings held true for 18 of 23 cancers studied.
" Cancers of the colon and kidney were among those with the strongest correlation to height." Tall people need to eat more. Therefore they take in more toxins.